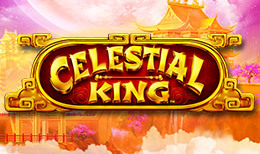 Travel to the exotic lands of the Far East and visit golden temples under expansive, starry skies in Celestial King, a game that brings the old and the new to one place. It’s in this land with centuries of mysterious myth and legend in its history that fortune may await. Mists swirl around the landscape as a giant moon illuminates the world around gorgeous, classically Eastern architecture, but the symbols on the reels that spin in front of your eyes are undoubtedly modern. Place your bet and start spinning to see if luck is on your side in this East Asian adventure. Celestial King has 5 reels, 3 rows and 25 paylines set against a classic backdrop of glowing, gold temples and a pink and orange sunset. The middle section of the screen, framed in gold, contains a wide eyed warrior standing astride a temple roof, under which the reels sit. The symbols are all modern style animation, but with an East Asian touch. The lower value, card symbols are in an Asian font, with the higher value symbols all being distinctly far eastern flavoured. There’s a pink lotus flower, royal and religious looking figures, and a medal and gold coins with Chinese or Japanese characters on them. The goddess is the highest value of these symbols. There is one wild symbols, but 2 different free spin features. The first is triggered by landing 3 or 4 scatter symbols. The second is set off by landing 5 or more scatters at the same time. Players are granted 3 respins in this instance, and the respins happen on a different board with up to 7 reels. There are also jackpot wilds that can be triggered at any point during the game, or during the free spin rounds. By upping your stake, you can increase the chance of a higher value prize. The background of this game is beautiful and calming, with the symbols on the reels creating some interesting contrast. The atmosphere it creates is distinct, considering the different illustration styles used at the same time. The different free spin features and the jackpot features make this game more unique above and beyond the base game. There are many slot games with East Asian themes and symbols inspiring their design, but this one is made a little bit different due to the extra features. It’s a solid offer to the slot game industry from Bally and certainly worth checking out.